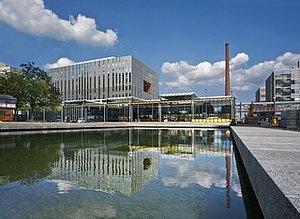 The starting point for the design of the MetaForum building by Ector Hoogstad Architecten is the sustainable preservation of the cultural and historical value of the former W-hal. MetaForum uses most of the existing structure, floor, foundation and façade of the old W-hal, so that the material is preserved as well as the visual culture. The old hall of the Department of Mechanical Engineering was erected in the first construction phase, 1957-1965, of the campus of the then Technische Hogeschool. 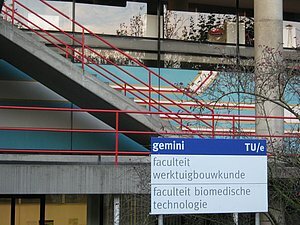 The W-hal is an important building which together with the Hoofdgebouw, Auditorium, Vertigo and Potentiaal forms the old core area of the campus. MetaForum is cooled and heated by means of the Aquifer Thermal Energy Storage (ATES) system of the TU/e Campus, so that no more boilers are required. In addition, the heating and cooling of rooms is regulated individually in combination with a presence detection system. Also, the air conditioning is switched off when a window is opened and the intelligent lighting control contributes to energy savings within the building. Finally, a total redevelopment of the existing façade of the W-hal has resulted in a substantial improvement of the energy performance. 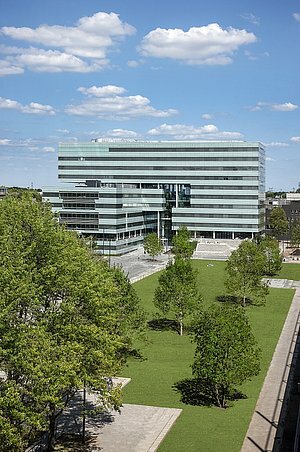 The new Flux building again sees TU/e take a major step towards a 50% energy-neutral campus in 2030. The building has an A++ label and an EPC of 0.6. The readings taken at the beginning of 2016 reveal that the heating consumption of this building is a factor 10 less than the average consumption per building in the past. With the occupation of Flux, TU/e has taken a big step towards cutting the use of fossil fuels. A reduction of 4 million m³ gas means that gas consumption has been halved since 2002. In terms of gas and electricity, the university is now climate-neutral. TU/e uses only green power and compensates the CO2 emission from gas consumption by reforestation, among other ways. A design requirement was that the building´s EPC should be 40% lower than demanded by the Building Order. They succeeded. The Flux building has an EPC of 0.6 and an A++ Energy label. There is no gas connection in the building. It is the 16th building on the TU/e campus to make use of the campus-wide thermal energy system and the third building without a gas connection. So, direct fossil fuel consumption is consigned to the past. The building is heated and cooled by concrete core activation in which the concrete mass is kept at a constant temperature, and this then brings the environment to a particular temperature level. This not only benefits energy consumption but also provides a pleasant stable indoor temperature. Other measures include a climate ceiling, after-heating of ventilation air and after-cooling of the labs using FanCoilUnits. The thermal energy grid at TU/e comprises a heat-and-cold ring. The advantage of this is that the buildings connected connected to the rings can exchange heat and/or cold with each other via the rings. With RC values of 5, the facades of Flux have a very high degree of insulation and the low building has a green roof while 300 square meters of solar panels will be installed on the roof of the high building. As for the lighting, LED and high-frequency TL lighting will be employed. In order to produce a fresh, amenable building for the users, many aspects are based on ‘Fresh Air in Schools’ Category A, and for other aspects category B. The building has mechanical ventilation with a heat recovery system and CO2 control. An open central area with roof windows ensures that contact with the outside world and daylight comes right to the heart of the building. Constructional (acoustic) facilities and their organization mean that the acoustics is an integral feature of the plan. In developing Flux, use has not been made of the BREEAM system, but informal calculation of the output specifications has shown that Flux complies with the BREEAM criteria for the ‘Excellent’ certificate. The Herman Hertzberger Architecture Studio drew up the design whose construction was undertaken by BAM Utiliteitsbouw. DGMR was responsible for detailing and monitoring the sustainability objectives of this project. 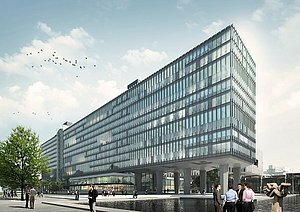 The Flux building was occupied at the beginning of 2015, having been designed for a low-energy consumption of 0.84 GJ/m², including the user component. Readings taken in March 2016 show that the consumption was even lower, at 0.82 GJ/m². That this is close to, and even below the design value, is exceptional. In practice, the actual value tends to deviate a lot. Read article in Onderwijs & Bouw (in Dutch). Go to renovation of the main building to sustainable building Atlas. The fourth project is a major makeover for the Gemini building for the departments of Mechanical Engineering and Biomedical Engineering. Because it will still take some time before this project gets under way, the building has already been improved in a number of respects.